Information is a powerful weapon in the fight against crime. As our partner, you’ll find all the latest news right here. SafetyNet: Smart Cyber Choices®, our Internet safety program for teens and parents, makes its long-anticipated leap to television during a half-hour special report on NBC San Diego this Sunday immediately prior to the Closing Ceremonies of the Summer Olympics! Sponsored by ESET, this program features our own Darlene Kanzler and SDPD’s Sgt. Chuck Arnold representing San Diego Internet Crimes Against Children Task Force as well as other guest speakers. Following this launch program, commercial spots will carry the message of SafetyNet to parents of teens throughout San Diego August 13th through December 15th. Also, a full-minute spot will provide Internet safety tips every Monday morning during the 6 a.m. morning news on NBC. Look for a thirty-second spot featuring ESET, SDPF and Assistant Chief Solis throughout the campaign. The call to action in all of these messages directs viewers to visit the SafetyNet site: www.smartcyberchoices.org, where parents can access the eLearning guide and learn how to keep their kids safe online. The campaign is called Calling All Parents: Keep Your Kids Safe Online. We are grateful to ESET, NBC San Diego, and Departure for support and donated services that made this parent outreach program possible. We thank all our SafetyNet supporters, particularly Verizon and the AT&T Foundation for their generosity. SafetyNet® manager Darlene Kanzler discusses cell phone dangers for kids in the article “Sexual predators using cellphones to prey on kids”. SafetyNet® Reaches 50,000 San Diegans! 2011 saw a tremendous amount of growth with the Police Foundation’s SafetyNet® program. With today’s wired youth, the demand for the program is ever-increasing through out the San Diego region. To date we have been able to bring this vital crime prevention program to over 41,000 San Diego middle school students and 1,045 educators in assemblies at their schools. Our classroom programs have reached over 5,000 students and 200 educators. In partnership with the San Diego Internet Crimes Against Children Task Force, we presented to over 4,000 area parents and foster parents. We appreciate all of the support that allows us to teach kids how to be safe online. In 2012 SafetyNet®, Smart Cyber Choices Parent Workshop became available online at http://www.smartcyberchoices.org/elearning/. This guide allows busy parents to learn how to keep kids safe online, at their own pace and on their own schedule. To reach the greatest number of people with this important information, the eLearning Guide will be available in Spanish this Spring. 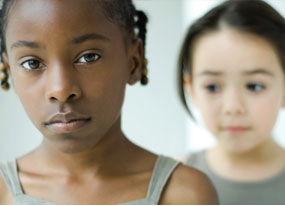 The Police Foundation is planning to embark on a mass media campaign to carry the SafetyNet message to more parents because of a marked increase in cyberbullying being observed by counselors in local schools. By continuing school assemblies, the Police Foundation will keep the program local, relevant and geared to what kids are experiencing in San Diego. If you are interested in scheduling a presentation, please contact Darlene Kanzler at (619) 232-2130 or email darlene@sdpolicefoundation.org. The Hausman Family joins Chief Lansdowne, Kristen Amicone and Dave Achenbach, who handles Igor, the K9 the Hausmans sponsored. Chief of Police William Lansdowne, along with civic and community leaders celebrated the start of a new era of comprehensive, on-site training for SDPD’s K9 Unit on Thursday, December 8th at the facility. The event included a ribbon cutting ceremony, K9 training demonstrations and facility tours. Windows and an attic to acclimate dogs to being carried on an officer’s back and being placed through windows, attics and small spaces. Durable stairs with open-back panels help train canines to negotiate open stairs, which are common throughout San Diego. Open panels in walls allow officers to hide explosives or narcotics for scent-training. Crawl-space aids in training the dogs to be comfortable in tight spaces. 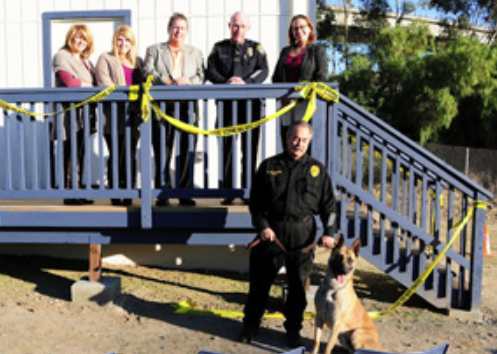 The new SDPD K9 training structure is made possible by the generous support of The Gary and Mary West Foundation, Calderon Builders, and Dixieline. The new structure will greatly enhance the K9 Unit’s training capability. 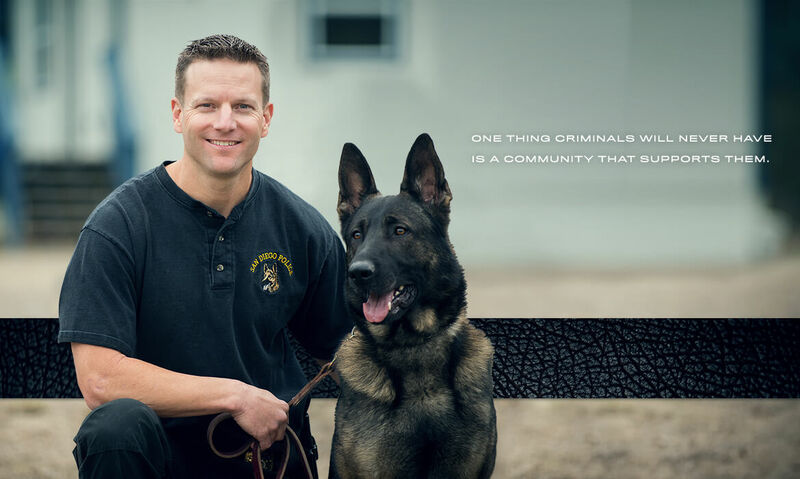 The Unit, which operates 24 hours per day, 24/7, currently has 27 canine teams consisting of one officer and one dog. Over the next 18 months many of the dogs will be retiring due to their age and the physical impact of the job. 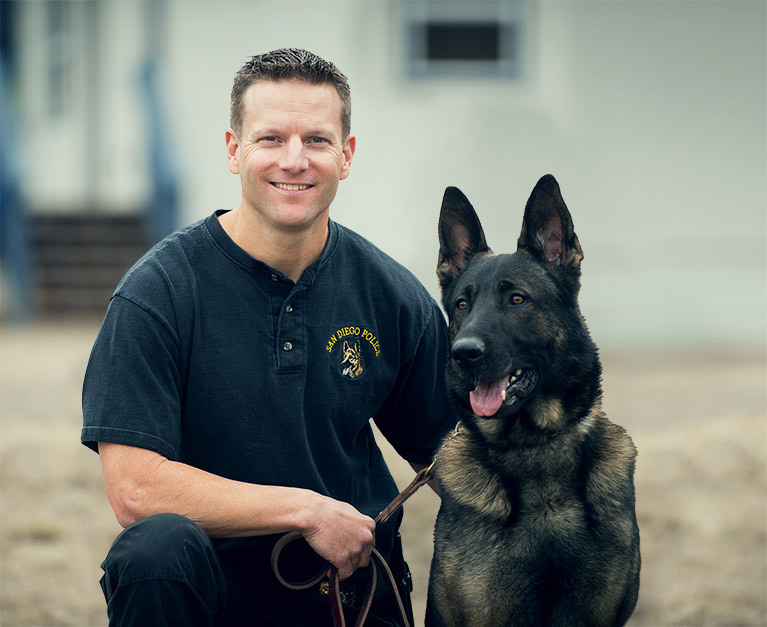 If you would like to support the K9 Unit, and the replacements for retiring canines, contact the Police Foundation at (619) 232-2130 or email kristen@sdpolicefoundation.org.